Nerve and blood vessel growth: "It's a really fundamental process"
10. 3. 2016 | Having started out researching skin, Christiana Ruhrberg moved on to studying how nerves and blood vessels grow and branch. Her research has shown how the body uses the same set of molecular signals to instigate blood vessel growth and nerve growth in the eye and brain. Understanding these pathways might help to develop therapies for blinding eye diseases such as diabetic retinopathy or age-related macular degeneration. AcademiaNet: You're Professor of Neuronal and Vascular Biology, and you study the growth of blood vessels and nerves - angiogenesis and neurogenesis. Your work has focused on two key molecules that are involved in these processes, the first is called vascular endothelial growth factor, or 'VEGF'. You made an important discovery about how this molecule controls the branching of blood vessels in the eye during embryonic development. How does this process work? Prof. Christiana Ruhrberg: If a tissue is starved of oxygen, it will secrete this molecule called VEGF. VEGF does two things: one of them is that it makes the blood vessels grow, or proliferate. Or, more specifically, it makes the endothelial cells that create blood vessels proliferate. But VEGF is also a guidance cue, and that's where my work comes in. VEGF is a molecule that is secreted from the oxygen starved site towards the existing vessel networks in a directional fashion, so that new vessels will grow towards the oxygen-starved region. VEGF works with the second molecule, neuropilin-1, in various different ways to promote angiogenesis. How do neuropilin and VEGF work together to promote growth of blood vessels? VEGF has several different receptors on endothelial cells. The main one is called VEGF receptor tyrosine kinase 2, and it transmits signals through enzymatic activity. Originally it was thought that neuropilin was simply helping VEGF to signal better through this main receptor. We discovered that neuropilin has a second role to integrate signals from the tissue environment around the blood vessels, known as the extracellular matrix. By translating cues from the extracellular matrix, neuropilin ensures that the blood vessels know where to grow so that they form a network that suits the tissue. You've also done some research on how neuropilin is important for nerve growth during development of the eye. In particular you made a very interesting discovery about how the nerves from each eye find their way to both the left and right hemispheres of the brain. What is the importance of this pattern of nerve growth? It's really important for stereo vision, to allow us to perceive depth and 3D structures. Our eyes are not quite in the same place, so we can see the same thing with both our eyes but we don't see it from the same angle. The brain can identify this shift and interpret it to create stereo vision. But it can only do this if it can map all the signals from the different parts of each eye. It does that by sorting the nerve impulses from each eye through a cable that is wired into both hemispheres. This wiring pattern helps the brain to reconstruct vision. We found that in order to route the nerves from one eye to the other side of the brain, you need VEGF to steer them. It's actually VEGF signaling through neuropilin, so the nerve routing uses the same two molecules that are important for growth of blood vessels. Prof. Christiana Ruhrberg | conducted her PhD research at the Imperial Cancer Research Fund. She was named Young Cell Biologist of the Year 1996 by the British Society for Cell Biology for her work on proteins that promote epidermal barrier function. Prof. Ruhrberg received postdoctoral training at the National Institute of Medical Research to study cranial motor neuron development, and at the ICRF to elucidate molecular mechanisms of blood vessel growth. 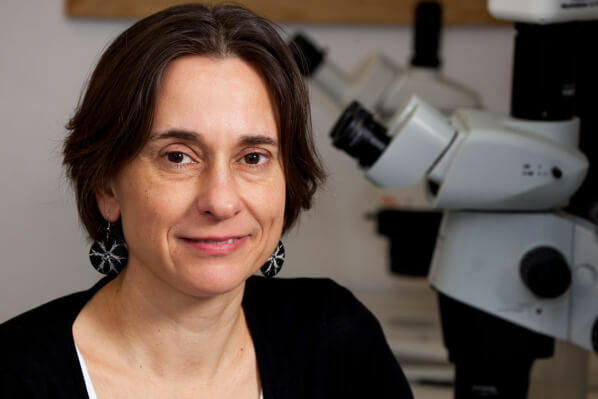 She is now Professor of Neuronal and Vascular Biology at the UCL Institute of Ophthalmology, where she holds a Wellcome Trust Investigator Award to investigate neurovascular interactions in the brain and retina during development and in disease. You're working on a new project that suggests that angiogenesis and neurogenesis might actively influence each other in the developing brain. What have you discovered during this project? One of the problems in many neurodegenerative diseases is that neurons don't normally self renew. But there has been a lot of research in many other labs suggesting that at least in mice, and possibly in humans, there might be some small pockets of activity in the brain where new neurons can grow from stem cells. There has been a recent surge of activity looking at whether new neuron growth is linked to blood vessel growth. For example, exercise stimulates neurogenesis, and antidepressants have been found to stimulate neurogenesis – both processes cause a surge in VEGF production. A lot of other labs are studying how VEGF may act on the stem cells in the adult brain. There seem to be a lot coincidental links, so that's something we're quite interested in exploring at the moment. We want to see if maybe we can use some of our developmental biology knowledge to understand better how VEGF, and blood vessels that have grown in response to VEGF, can shape the generation of new neurons, and the other way around. Then maybe it would be possible one day to use this knowledge for therapies. This would involve recreating an environment typical of a developing, growing brain to reactivate neurogenesis in the adult brain, where neurons do not normally grow. Why do you find this particular area of biology so fascinating? I think it's the implications. The principles apply to the brain, they apply to the eye, but they also probably apply to many other parts of the body as well. Blood vessels are everywhere, and they need to interact with all organs and each tissue inside the organs. So it's a really fundamental process. And if it goes wrong, it can lead to a lot of different diseases, such as diabetic retinopathy or age-related macular degeneration. Also, it means I don't have to restrict myself to being interested in one little niche – if I specialise on blood vessels and nerves, my research can be relevant to a lot of different biological questions and medical problems. As well as conducting research in a range of projects and teaching, you review grant applications for the Wellcome Trust and British Heart Foundation, and you are an editor for the journal PLoS One. How do you manage to fit it all in? With great difficulty! There is no such thing as a normal working week, 37 hours as we're contracted to work doesn't cover everything. If I just add up all the hours I'm working on each research grant I hold, that's already adding up to more. Not to mention the grant reviewing, peer review of research papers and teaching, it all has to fit in. It helps to like your job, so you don't mind the long hours. It's a bit like having your job and your hobby at the same time. Dear Prof. Ruhrberg, thank you very much for this interesting interview.